want a massive vegan dinner for 2 priced at under 20 bucks? head over to little ethiopia on fairfax and hit up rosalind’s. i know, i know, i probably shouldn’t be sending any business whatsoever away from the vegan ethiopian restaurant across the street…but i just like the food and atmosphere at rosalind’s sometimes for a change. plus, it’s always good to know this place is here and super vegan-friendly if you are ever need to dine ethiopian-style with some omnivores. 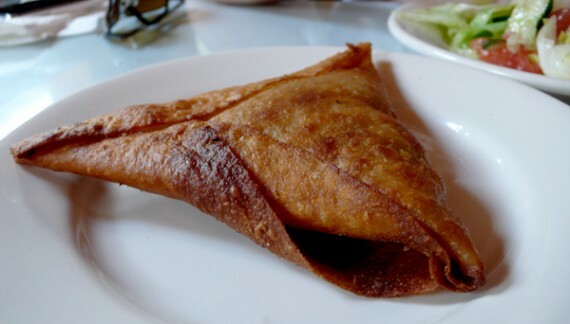 to start at rosalind’s, we always get a couple lentil sambusas. at just $2.50 a pop, these things are pretty big and they come with a fresh and crispy green salad. 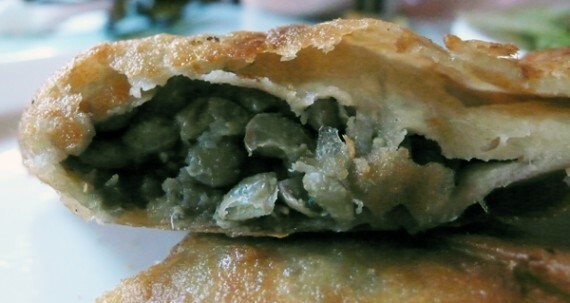 a sambusa is basically a fried up pastry shell, and in this case it’s filled with a dark lentil stew that’s absolutely delicious. i could eat these things everyday, and no matter how hard i try to resist, i definitely end up eating one every time i’m at rosalind’s. as a main course, the two of us always without fail order the vegetarian combination to split between us. this comes with several stew-type dishes including collard greens, chick-pea, yellow split-pea, red lentils and cabbage. 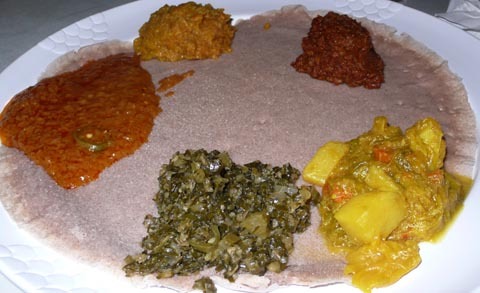 this stew, also known as wot, is served on a huge piece of injera (aka radical spongy bread) with a plate of injera rolls for scooping. that’s right, you don’t use silverware in little ethiopia, you eat with your hands. keep it clean and tidy by only handling the bread, but don’t ask for a fork or you will give yourself away as a n00b. 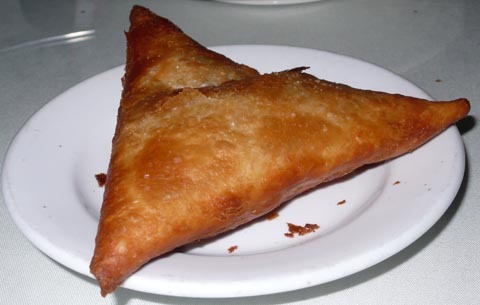 the combo is huge and with a sambusa each, it’s definitely enough food for two people. that means before tax, tip and booze 2 peeps can eat for just under $19! 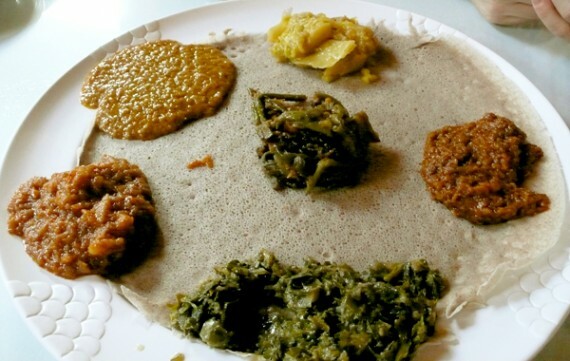 my favorite thing about ethiopian cuisine, is all the rich and deep flavors that come packed into every dish. all the tastes are so unique and unlike any other food i’ve had before. rosalind’s especially, makes stew that is so thick and delicious, it tastes like it’s been cooking for days to bring out the right balance of spices and seasonings. if you have never tried this stuff, you are seriously missing out on some of my favorite food in los angeles. now i know i’ve written about rosalind’s before, but that was well over a year ago and i wanted to remind you that this place existed. the food is what i would consider the best in little ethiopia, the atmosphere is totally classy, and the service is friendly and attentive. 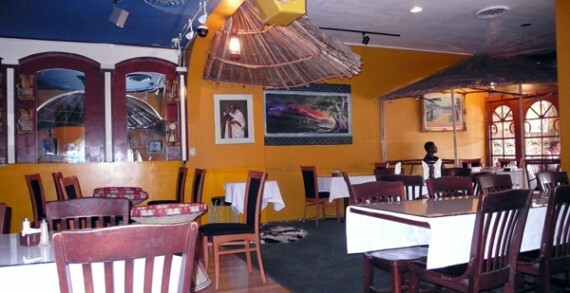 next time you feel like some ethiopian food and wanna step your experience up a notch, hop over to rosalind’s. just be sure to tell them you are vegan, and they will take care of you. oh, and did i mention they have a full bar? yes! i’ve been frequenting the little ethiopia district on fairfax for years—from rahel’s, to messob, to nyala, i’ve tried plenty. 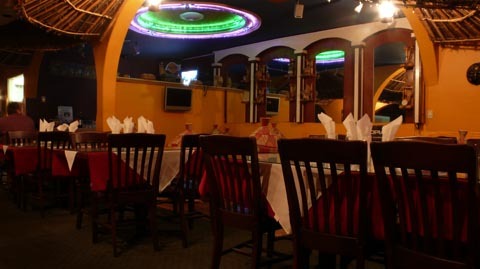 and of all these similar ethiopian restaurants, i like rosalind’s best. sure, maybe i am being a traitor. maybe i should blindly pledge allegiance to rahel’s, because it’s 100% vegan…but something about rosalind’s just keeps me coming back. maybe it’s the super chill atmosphere, or the fact that the same waitress is always on duty and she has my order memorized. i dunno. whatever it is, it’s more than just the amazing food. now for the uninitiated, ethiopian food is something quite special. it’s massively tasty, reasonably healthy, and some of the best vegetarian fare in los angeles. i love the fact that the vegetarian dishes are kinda just, well, vegetarian. i don’t worry about chicken stock, fish sauce, lard and other horrors like i do at many restaurants. ethiopian food is pretty much pure herbivore goodness, and if you order it sans the obvious meat, you are almost always safe. now, as i hinted earlier, most of the food that i’ve tried in the little ethiopia district of fairfax is totally comparable—i urge you to sample every last restaurant and make your own mind up. but one thing that really sets rosalind’s apart is the incredible atmosphere. nyla’s decor is too bright, rahel’s isn’t quite cohesive (umbrellas hanging from the ceiling…wtf), and messob is just too small and kinda blah. rosalind’s on the other hand…well, it’s hip, dim, slick and authentic—all rolled into one.